The British car maker's latest program is a dream come true. It seems almost too good to be true: a gorgeous 1970 Aston Martin, without the hassle of a decades-old engine and transmission. 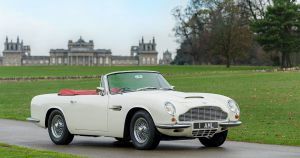 The storied British automaker announced this week that it’s planning to offer a service in which it converts some of its most beloved classic cars to electric power using a self-contained, all-electric powertrain. It’ll take the form of a self-contained “cassette” that can be slotted underneath much older chassis like the DB6 Vantage. It wasn’t clear from the press release whether Aston Martin would perform all conversions itself, or whether it would sell the kit to third-parties who wanted to perform the upgrade themselves. Futurism reached out for details about the future sale of the drivetrain, and we’ll update the story if we hear back. Miss the roar of a 280 horsepower straight six engine with a 5 speed manual? Worry not. According to a press release, the Rapide E electric drivetrain will be completely removable, allowing car owners to reinstall the original engine and manual gearbox. In 2018, car collectors can have their cake and eat it, too — without the emissions. What’s not to like?